The MetroHartford Alliance proposes to support the City’s Department of Development Services Division of Planning by developing, with the City, HARTFORD 2010: A Vision and Action Strategy (the “Framework”). The Framework will build on the considerable accomplishments of the past five years and be designed specifically to attract additional private investment in the City through a series of targeted capital investments. The Framework will reflect the community’s vision for a dynamic, livable, healthy, and economically vibrant City. 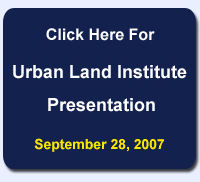 It will build on Hartford’s natural, economic, cultural, social and physical assets that include its: compact Downtown and historic neighborhoods; relationship to the Connecticut River; historic pattern of radial boulevards and neighborhood shopping streets; major educational institutions; legacy of neighborhood parks from its turn of century "Rain of Parks”; transportation infrastructure; major employment concentrations; and residential neighborhoods. The Action Strategy will propose strategies that start from an understanding of the interconnectedness of these assets and that identify specific actions that will shape the City’s future development, enhance the connections between Downtown and the surrounding neighborhoods, and strengthen the City’s role as the heart of the Region. It will serve as a benchmark for decisions that affect the City’s future as well as a marketing tool to promote development and investment. 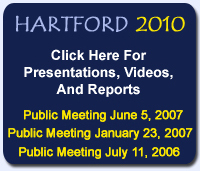 Hartford 2010 is closely related to many other initiatives underway throughout Hartford. Click here to read more about the context of Hartford 2010. As the study proceeds we will be sharing ideas and findings on this website to make this an open and transparent process. We want to stress that what follows is a work in progress. We have not reached any firm conclusions but are in the middle of Phase One which is intended to identify those areas which seem to be most promising for more detailed study. The initial “backgrounders” prepared by the team in the areas of Urban Design, Landscape and Ecology, Transportation and Economics. This is a reflection of the complexity of the issues. We are trying to develop an understanding which is not only about the physical environment but is equally focused on social and economic conditions and opportunities. In preparing these “backgrounders" the Team has been engaged in consulting with many interested parties, looking at existing conditions and reviewing a great volume of plans and studies that have come before. We have been looking at the recent patterns of success, the next generation of approved plans and proposals, current community efforts and a range of public sector initiatives already underway. We are also taking stock of previous efforts like the 1998 Downtown Hartford Urban Design and Economic Action Strategy, the various NRZ Plans and other area specific plans to better understand what worked and what didn’t and hopefully why. Our starting points include looking at a broad range of issues at multiple scales - the region, the city, and the very local - including the 17 neighborhoods that make up the City, the significant junctures between these neighborhoods, the network of parks, trails and river access points, including potential additions, neighborhood centers and traditional retail strips, employment centers, cultural institutions, major and minor opportunities for redevelopment. These backgrounders represent an important first step in trying to a range of specific areas that we concentrate on in more detail in the next phase of our work. There will be multiple opportunities for reaction and input and your feedback has already been and will continue to be an essential element in formulating our approach. The project includes three phases. Phase One: Identification and review of issues, opportunities, strengths and weaknesses. Phase Three: Implementation Tools and Strategies. This site is intended to keep all stakeholders informed of the work of the Hartford 2010 team and provides an efficient means of receiving suggestions and feedback. Documents, Charts, Maps and related materials will be posted here. A member of the team will review all suggestions and feedback.